Download WCE: 3/19/19 Missouri attendance, Deontay Wilder, ESPN leaks WCBB field, CBB picks! Users who like WCE: 3/19/19 Missouri attendance, Deontay Wilder, ESPN leaks WCBB field, CBB picks! Users who reposted WCE: 3/19/19 Missouri attendance, Deontay Wilder, ESPN leaks WCBB field, CBB picks! 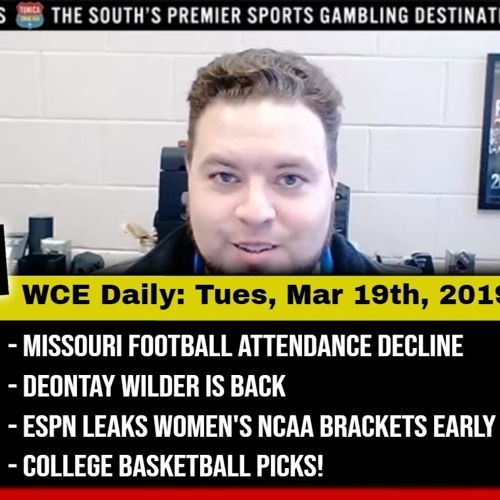 Playlists containing WCE: 3/19/19 Missouri attendance, Deontay Wilder, ESPN leaks WCBB field, CBB picks! More tracks like WCE: 3/19/19 Missouri attendance, Deontay Wilder, ESPN leaks WCBB field, CBB picks!